We are offering a Bachelor in Geosciences program for undergraduate students. Most of our students are from Germany, but we start to have more international students at the Bachelor level. Most of our undergraduate coureses are offered in German, some are offered in English. At the graduate student level, we offer an international Master's Degree Program in geology, and further research opportunities leading to a Ph.D. in geology. Students can specialize in several fields, among which geology, tectonics, geodynamics, earth surface processes, and resource geology. All classes are offered in English. 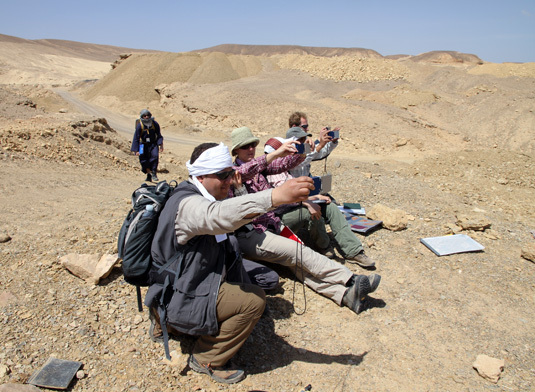 Participants of the geological field mapping course at the Red Sea estimate the dip of some distant sedimentary layers ( © A. Friedrich).